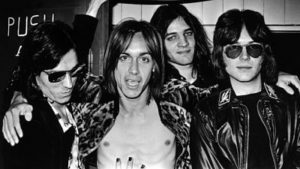 From the inimitable filmmaker Jim Jarmusch (Only Lovers Left Alive, Broken Flowers), comes the a music documentary film Gimme Danger, which chronicles the rise and fall of legendary punk rock band The Stooges (featuring the equally inimitable Iggy Pop, who appeared in Jarmusch’s 1995 Western Dead Man). Emerging from Ann Arbor, Michigan amidst a counter-cultural revolution, The Stooges’ powerful and aggressive style of rock-n-roll blew a crater in the musical landscape of the late 1960s. Assaulting audiences with a blend of rock, blues, R&B, and free jazz, the band planted the seeds for what would be called punk and alternative rock in the decades that followed. Jarmusch’s movie presents the context of the Stooges emergence musically, culturally, politically, historically, and relates their adventures and misadventures while charting their inspirations and the reasons behind their initial commercial challenges, as well as their long-lasting legacy. The R-rated Gimme Danger features revealing new interviews with the band’s members, including Iggy, live performances and a soundtrack packed with wall-to-wall Stooges classics.